These egg quinoa protein breakfast muffins will start your day the right way & leave you full until lunch! Anyone else working on getting healthier this year? I definitely indulged too much this holiday season – yikes! It feels good to be getting back to healthy eating. I’m working on adding a lot more protein to my day. 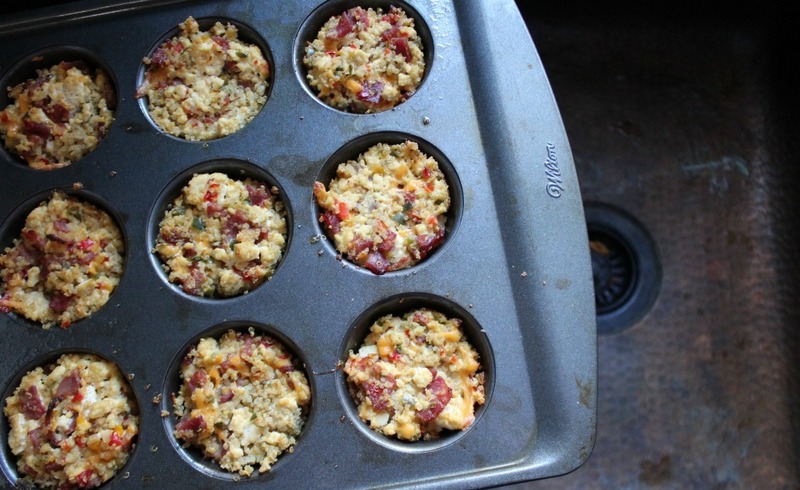 One of my favorite ways to do this is with my favorite healthy breakfast: these egg quinoa protein breakfast muffins. I love that these can be totally customized. I used peppers and kale, but you could easily us broccoli, asparagus, spinach, sundried tomatoes, etc. I used chicken sausage, but you could substitute ham, chicken or bacon instead. I used feta cheese, but you could use goat cheese, cheddar, pepper jack, etc. Just follow the basic formula for the recipe and then feel free to substitute your own veggies, meat and cheese! Adding quinoa really helps to add bulk to this recipe, and will leave you full all morning. It’s a great way to use up leftover quinoa from a dinner recipe too! 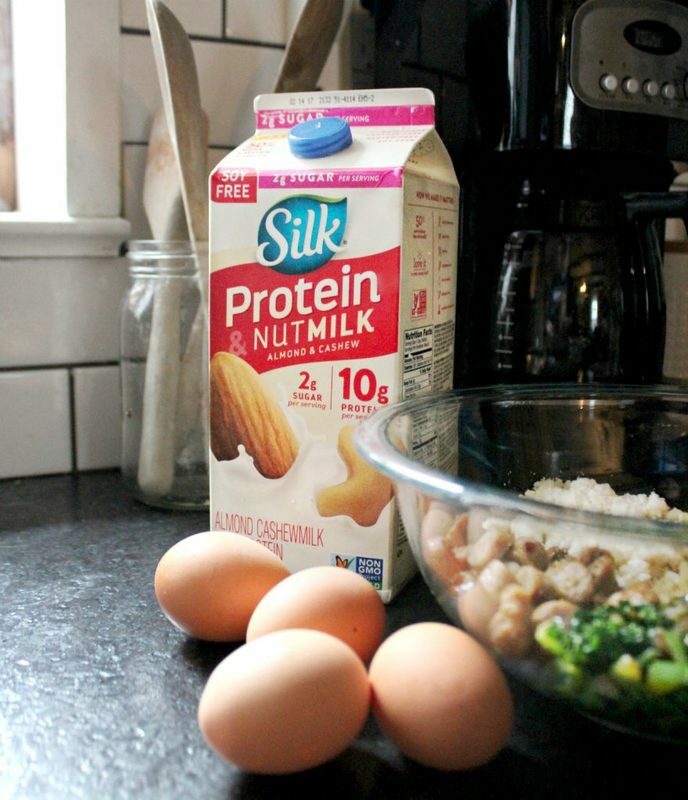 One of my favorite new discoveries is this protein nutmilk from Silk. I used the plain one in this recipe – but the vanilla one is SO good too. It’s made of pea protein, as well as cashew and almond milk. It’s got 10 grams of protein in every cup! 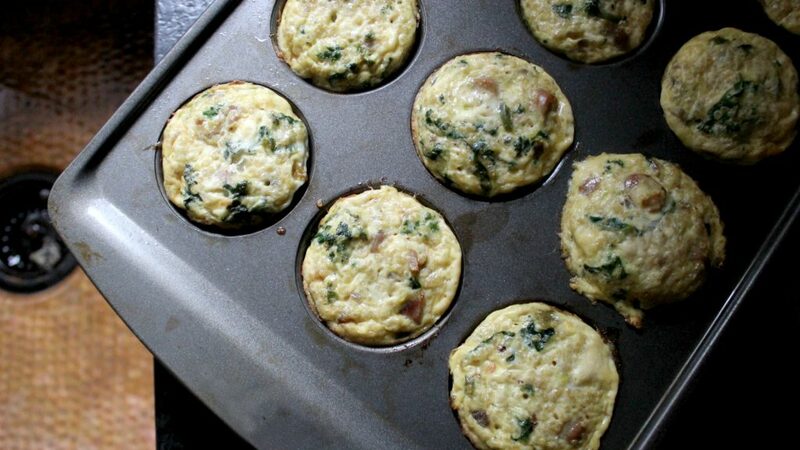 These breakfast muffins are SO good, and they freeze really well too. So you can make them in batches, freeze, and then thaw when you want to use them. Saute onion & bell pepper in olive oil for 4-5 minutes over medium heat. 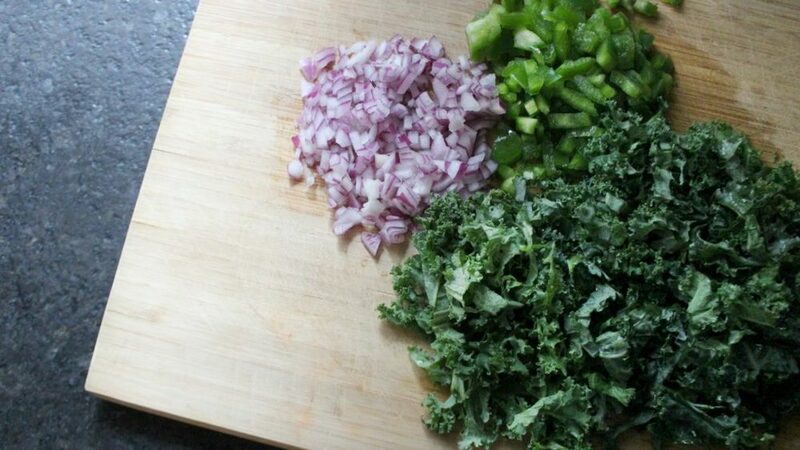 Add the kale and cook until slightly wilted - 1-2 minutes. Transfer cooked vegetables into a bowl. 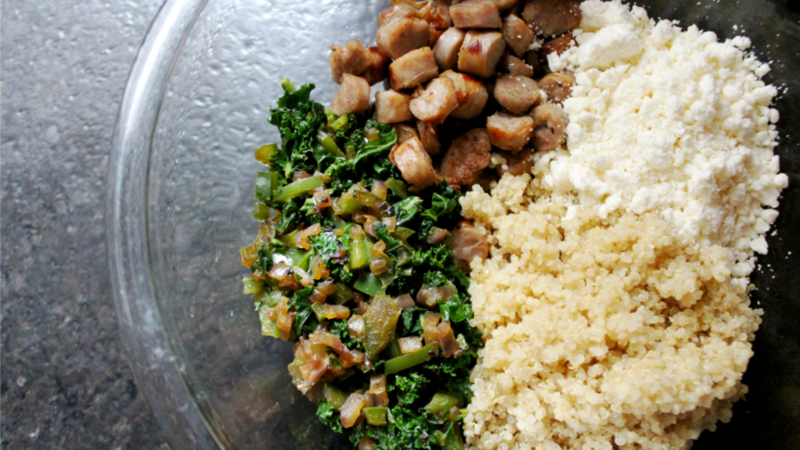 Add the sausage, feta, and quinoa to the bowl. 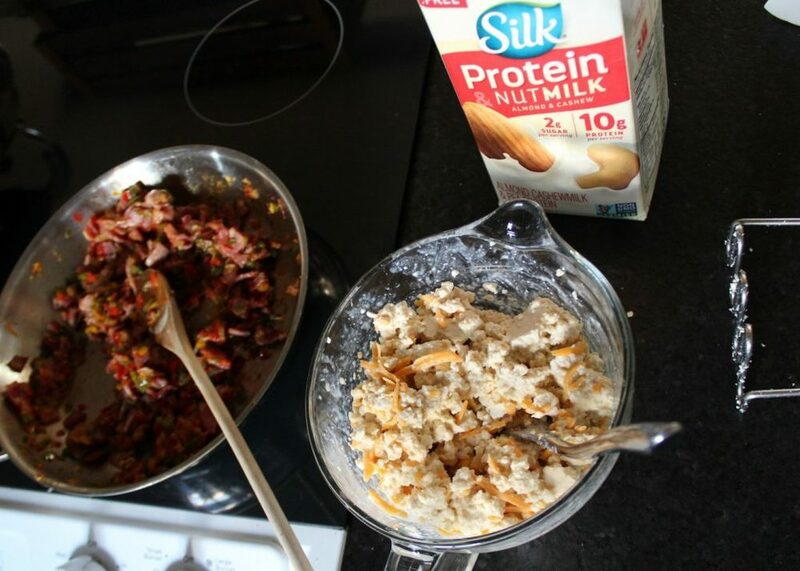 In a separate bowl, whisk the eggs together, and then add the protein nutmilk. 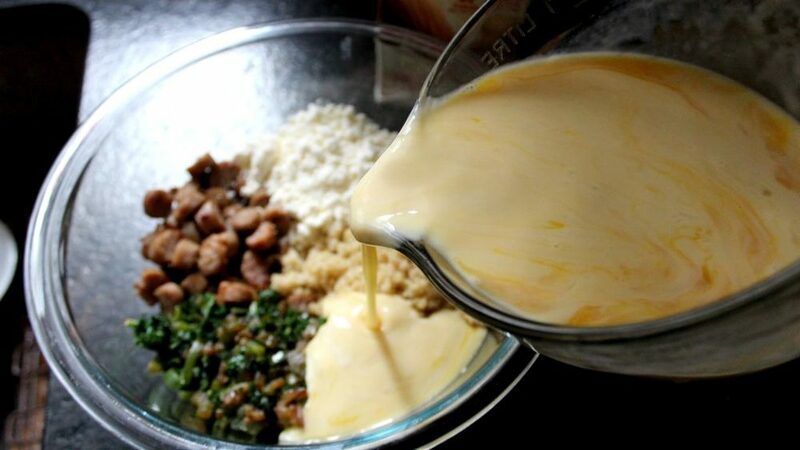 Pour the egg mixture into the bowl with the other ingredients and stir until combined. Divide the mixture evenly into a well greased muffin tin. Bake for 20-22 minutes, or until set. I challenged myself to make this recipe vegan-friendly. I was really skeptical, but it actually tasted *really* good! Follow the same instructions as above with the vegetables, but use a vegan meat substitute, cheddar vegan cheese substitute (same measurements), and then instead of the eggs, use a 15 oz. block of tofu. Make sure you squeeze the water out of the tofu, and then mash it with a banana masher before you mix it with the Silk protein nutmilk. These are best eaten with a fork – but the taste is awesome! And they’re *packed* with protein. If you like this post – pin it here. These look so yummy! I love versatile recipes like this!